An industrial control network is a systemof interconnected equipment used to monitor and control physical equipment in industrial environments. These networks differ quite significantly from traditional enterprise networks due to the specific requirements of their operation. 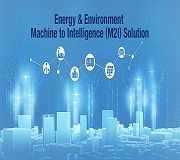 Unlike a conventional network, which supports data processing and transfer, the primary function of Industrial Networks is to control and monitor physical equipment; in particular, for manufacturing, processing and utility distribution. Industrial network equipment must perform under harsh environmental conditions, such as heat, dust, and vibration. High reliability is critical, and round trip times must sustain no longer than 20 ms. The type of Industrial Equipment is often based on the interface type and the protocol it may support. In the past, serial devices provided low speed transmission of data, and the interfaces supported RS232/422/485; management was not as important as data transmission. But soon a requirement for management evolved, and protocols such as Profinet, Fieldbus and others like Allen Bradley by Rockwell (for EtherNet/IP) were developed. Such protocols werenot cross-compatible, which made the equipment specific for those protocols. As a result, Plant, Automation and other installations were to a great degree committed to procuring equipment that would only monitor and manage the network for that specific protocol. 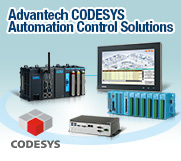 Profinet, Modbus, Fieldbus and Allen Bradley have been the protocols most often used. However, as Ethernet has dominated the enterprise networks, its impact is re-shaping the typeof industrial equipment, as well as its attributes. The protocol of EtherNet/IP has emerged, to meet an industrial automation protocol, while based on an Ethernet standard. The EKI-5500/5600 Switch Series is an ideal choice for Industrial Networks. These versatile, multi-port switches have been designed for Industrial Networks, so hardware requirements are met for all applications. Supporting an array of protocols, management of the EKI Switches and their link partners make it easy to discover any errors on the network and quickly resolve them. And they meet significant environmental standards for high reliability. Industrial Automation had a completely different set of requirements than LANs. Serial interfaces on the equipment were common, and while data transmission was critical, analyzing the data was not a consideration. However, management and monitoring some of the devices became important, and management systems such as Modbus, Profinet and others emerged. In the late 1990s, manufacturers used open message structures like Modbus ASCII and Modbus RTU, to support SCADA systems. SCADA systems today are in line with the standard networking technologies, and still widely used in industries such as wastewater treatment plants, gas pipelines, wind farms, manufacturing and others. 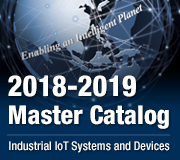 Plant automation and other like environments are experiencing a transformation, in that the types of equipment used, such as PLCs, I/O devices, HMI and workstations are more readily available in supporting protocols such as EtherNet/IP, whereas in the past it was Modbus, Profinet and many other customized management systems. In a move away from only serial interfaces, an RJ-45 interface is commonly available on plant automation equipment today. This allows the network to use EtherNet/IP, a protocol which the network administrator can use to simultaneously control, configure and collect data from the devices on the network. A customer approached an Integration Solution specialist requesting help on revising a network for a Bottled Water Company. Since it isa plant automation application, he needed a network device that could support a variety of protocols, such as those used in a SCADA system, but also for EtherNet/IP. At the Bottled Water company, the main connection to the LAN/WAN was a device using the Modbus Protocol exclusively. However, the plant owner wanted to upgrade the network in the different machine control areas and the facilities control center to now support EtherNet/IP. He liked the value of using a network technology that is used in WANs and LANs around the world and can support hundreds of nodes. He also wanted the other monitoring devices for his plant that would still support some Modbus-based products. The EKI-5526C-EI switch was the recommended replacement at the main connection (see Master Data Server in diagram). A 16-port switch, it supports EtherNet/IP, so its flexibility provided the owner exactly what he needed. Providing speeds of 10/100 and up to gigabit, while offering a software feature set for management via a web browser, and levels of security, the switch will carry the load of communicating to the devices at each control center in the plant. Redundant DC power is also a plus, and the switch meets an IP30 rating for durability. The 16 port switch allows future growth as more equipment is installed at the Bottled Water plant. At the Master Data Server Center, connections from the copper ports had to connect to devices in Machine Control Room 1 and Machine Control Room 2. A separate connection to the Facilities Control Room was chosen, to ensure the network would remain functional and not impact network performance. At Machine Control Center 1, an EKI-5528 switch was recommended, to connect the HMI, the PLC equipment and hand-held I/O devices for the workers to monitor the machine operations. An 8-port switch with all copper ports and management was a good solution. Since the brand name labels for the bottled water were applied to the plastic bottles in this control center, a Rockwell PLC was already installed and running RSLogix. Connected to the existing PLC was a PC, for connectivity and management. The PC in Machine Control Room 1 could also be used to import AOI faceplate files (Add On Interface). The AOI files are included with the EKI switch series, to support protocols such as Allen Bradley and others that Rockwell developed years ago. AOI allows the plant manager to view the switch as a Rockwell-based device, with associated port settings and identifiers. The EKI-5528 switch had to support FactoryTalk View 8.0, a GUI for monitoring, and could be setup using RSLogix 5000, a Rockwell Software program. 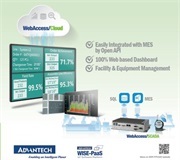 One unique feature Advantech offers in the FactoryTalk View is a graph, allowing the end-user to quickly see the Advantech switch status including system MAC, IP address, CPU usage and port status etc. At Machine Control Center 2, another EKI-5528 can be installed, and connected to the PLC device that has a copper port; this control center is where the water bottles are filled with filtered water and secured withcaps automatically by a special machine. HMIs were installed there, just like in the Machine Control Center 1. At the Facilities Control Center, located in another area of the plant, copper cabling provided the connection back to the headend. A third EKI-5528 switch installed in the Facilities Control Center, which providedconnections to the HMI, as well as to an APAX-5070, a two port Communication Coupler that supports Modbus/TCP Protocol. 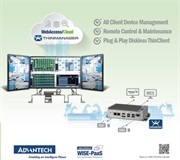 EDS, Electronic Data Sheets, are simple text files used by the network admin in this control center, to utilize configuration tools which help identify the Advantech devices and easily configure them. At this control center, the water purification equipment filters water that is transported to the bottling section of the plant. This area is in a controlled temperature environment due to the type of equipment and water filtration. In summary, Advantech was able to provide a whole solution to the Bottled Water company, including multiport managed switches, HMIs, I/O devices and additional features such as the FactoryTalk View interface, EDS and meeting plant automation environments for variable temperatures, dust and other hazards. Q: How many ports do the EKI switches provide? A. The EKI-5500 Switch series offers 8 ports. The EKI-5600Switch series offers 8,10,16 and 18 ports. The 10 and 18 EKI-5600 switches have combo ports. Q.: What environmental standards for these ruggedized switches are supported? A. The Switches are UL508 certified, and meet Class 1, DIV 2 standards. These standards are a requirement for the oil and gas industry,and other automation environs. The extended temperature of -40 to +75C, along with dual DC power inputs are common attributes of the hardware design. Typical UL and FCC standards are met for Class A products. Q: How easy isthe management interface to use? A. If using the Profinet protocol, and Siemen’s software is installed, theEKI GSDML filescan be imported, and displays the switches in the network topology. For Modbus, the Modbus TCP/IP table is available in the user manual for reference (NOT RELEASED YET). For EtherNet/IP, the EKI switch can be integrated into the Advantech Open control solutions or a Rockwell SCADA monitoring system. Q: What management options does theEtherNet/IP protocol have? B. It also support EDS, Electronic Data Sheets, which are simple text files used by network configuration tools to help the administrator identify the switches and configure them on a network. Q: What if my customer needs a fiber interface in addition to copper ports on the switch? A. The EKI-5600 series offers 10 port and 18 port models with two SFP fiber ports. These switches have “combo” ports, wherein two gigabit SFP ports can be used for fiber, or two gigabit copper ports would be available for more connections. The fiber SFP ports will support Multi-Mode or Single-Mode fiber.